I have a tree in front of my place and it is having hard time due to the weather shifts. I have been looking all over the internet to try to identify it so that I can get the right fertilizer for it. I was hoping someone could help. Like stormy correclty said, it is Schefflera, and judging from the fruits on your tree I would say Schefflera pueckleri (a.k.a. Umbrella tree or Tupidanthus calyptratus). It is native to Australia and Indonesia, and needs tropical climate and wet soil. I think it will benefit from fertilizer, but please answer stormy's questions about where you live, and condition of the tree and history to get the right advice about fertilizers. Schefflera tree Based on my assumptions I am going to give this at least the genus name: Schefflera...tree. This is an indoor plant where I have lived. Small. Makes great Bonsai. You must be in a nice warm and sunny place, yes? The species name shall be coming along shortly by someone. You lucky dog. That mold on your stucco is a big problem. It means bacteria are decomposing that siding. Keeping the siding dry, no matter what kind of siding, will mean your siding won't have to be replaced, repaired too soon. Need a picture of the entire 'tree/large shrub'. 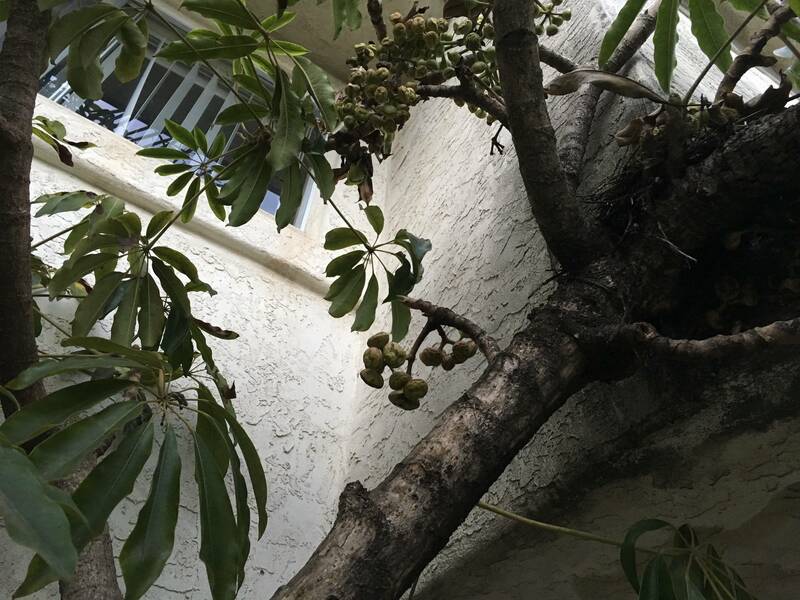 Probably recommend cutting that entire branch shading/touching your stucco siding off the main trunk of this plant. Planted this close to the foundation in some tropical area is not the problem that it is in higher latitudes. But you'll want to remove that branch and clean the siding/stucco and then repaint with primer and and then paint with mildewcide. I'd do the entire wall or house with that kind of paint. Dying to hear where it is you live! As to fertilizer we need to know how long you have been the owner of this plant, has this plant looked better in the past? Is this on the North side of your home? Do you know the previous owners? Need more pictures especially of the soil and trunk interface, other plants nearby, the condition of the soil bed, why you think fertilizer is a problem (if it hasn't had any fertilizer at all it could use a balanced, extended release fertilizer at least once per year). Is there lawn nearby that gets fertilizer that this plant is also being able to take up? When we find out more of the details, we will be able to recommend a maintenance program as well as some pruning. Why is my palm tree dying? What is wrong with these pine trees?